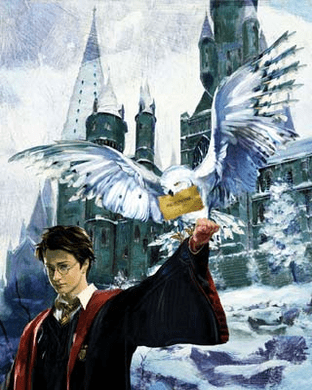 Jim Salvati Harry Potter Canvas Giclee Artist Proof Co-Signed By Daniel Radcliffe:"Harry & Hedwig"
Edition: Limited Edition to 28 artist proofs total that are signed by both Jim Salvati and Daniel Radcliffe. About the Art: Painted by Jim Salvati, and inspired from the film Harry Potter and The Goblet of Fire, which is taken from the series of novels created by JK Rowling. The importance of this image lies not just in the fact that mail is delivered by way of owls, but also in Harry's facial expression, in which there appears both a wariness and determination toward the news the owl brings. This image also shows the closeness between Harry and Hedwig, and the mutual affection shared between the two. The producers of the Harry Potter movies brought Salvati on board to develop original interpretive production art. Through use of a subtle and soft quality, Salvati is able to bring complex and detailed ideas to visual reality. His originals are created with a richly textured style in the medium of oil painting. As a professor at the prestigious Art Center College of Design in Pasadena, California, Salvati seeks to stay in tune with the continually evolving approaches within art through artistic diversity. Jim's experience and knowledge cross many boundaries, from print, film, animation, to the fine art of Disney and Warner Bros. studios. Jim's fine art is collected throughout the world. Each print in both editions are signed by Jim Salvati.